Adding An Dining Room With A Debden Orangery. When you’re living in a single story bungalow it can sometimes feel a little cramped especially if you’ve come from a large family home. This was the case for the Debden couple. Their bungalow was perfect except that there was no dedicated dining room and fitting a table and chairs into the living room made the overall space too small for comfort. The answer was to build a dining room extension. And not just any extension. They wanted something beautiful that would really add some impact to the facade of their bungalow. Which is why the visited the Cambridge Conservatory Centre at Scotsdales Garden Centre to find out what might be possible. After taking a look around our Show Site they were completely taken with our display Orangery. Nothing else would do. They wanted one for themselves. And of course we were happy to oblige! The windows and doors in the bungalow were white uPVC so we used this as the starting point. In smaller spaces it’s vital that materials match or the interiors will feel disjointed and even smaller than they actually are. 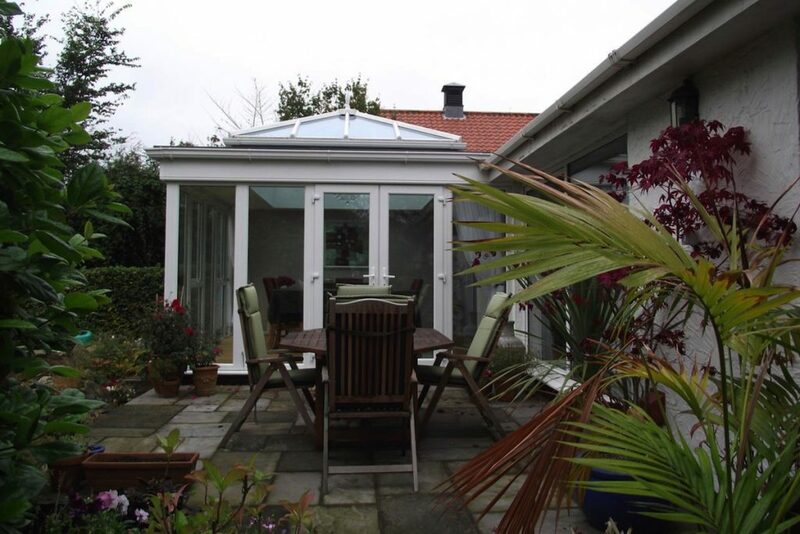 As the bungalow had a hipped roof, it made sense to replicate this on the roof of the orangery. And certainly the lantern roof lends itself perfectly to this traditional shape. 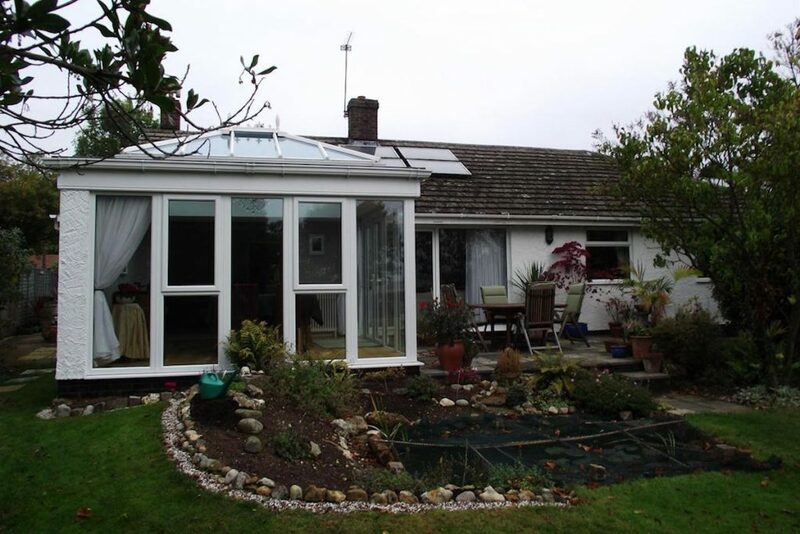 Using a wide bargeboard between the tall glazed doors and windows allowed us to run the existing guttering neatly to a natural end point and allow the Debden Orangery guttering to follow all the way around the building. The solid wall to the left hand side (as you look at it) was rendered to match the existing house and provide continuity between the original and new parts of the home. Casement windows open to allow a breeze to flow through the Debden Orangery and French Doors provide access to a cosy patio area. Nestled in the L-Shape that’s been created by the addition of the orangery, the patio is the perfect place to enjoy a leisurely lunch on a sunny day. With access from both the living and dining spaces, the owners love how their home flows from inside to outside. They’ve created a lovely garden with pond just outside the windows of their Debden Orangery Dining Room so they can see it every day. Now that’s how you do a dining room extension!